By the age of twenty-two, he was a regular on the Arthur Godfrey Television Show. With great success he lasted twenty three months until the headlines announced "Godfrey Fires Protégé". Julius went on to collect stage credits in Neil Simon's first Broadway success, Come Blow Your Horn. He has headlined musical shows throughout North America. Julius appeared on numerous television shows in the 50's and 60's numerous theatrical productions. He also had a regular radio shows in New York for a number of years and of course continues to perform in concert halls and outdoor festivals on a regular basis. 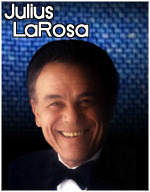 LaRosa is truly an entertainer with experience, and to quote the New York Times "his singing is very direct and unpretentious - he can wrap his voice tenaciously around a melody line and bring out the best in it. He is certainly an equal partner to the song lyric." Julius continues to give life to many of the popular songs from the 40's and 50's. His hit recording of "Eh Cumpari" has become an Italian Tradition throughout North America. His other hit records include "Anywhere I Wonder", "Domani" and "My Lady Loves To Dance".